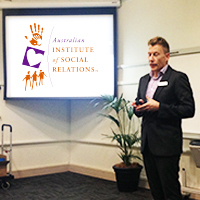 T he Australian Institute of Social Relations RTO 102358 is the training division of Relationships Australia South Australia. We have provided high quality, accessible and cost-effective health and community services training, to a wide range of professional groups for 20 years. We bring together current evidenced-based research, professional education and direct service delivery experience – offering a unique foundation for all our training. We recognise that quality services rely on quality staff. We are committed to assisting staff to gain skills, knowledge, and attitudes that ensure quality community and human services. Our nationally recognised training includes family dispute resolution, counselling, youth work, children’s services, and disability work. We work in partnership with communities, organisations, teams, and individuals, striving to develop skills and competencies that can be applied within real job contexts. The Institute offers individual modules or combinations of nationally recognised competencies; full Certificates or Diplomas; customised workforce development programs; peer-mentoring options and/or courses and programs with a focus on interpersonal skill development. Our highly experienced and adaptable training team is equipped to travel to remote and regional areas, and nationally. We can and do deliver training on worksites; within communities; online and/or at the Institute’s training centre in Hindmarsh. We cater for individual need; we understand that for some people, nationally accredited qualifications are very important; and for others, building capacity and focusing on sustainable outcomes is more important. ‘A person constructs a sense of identity in relation to family, other people, cultural practices, gender, social class, social/political systems, sexuality, geographic location and physical and mental abilities’. The Institute’s multidisciplinary approach to Social Relations draws upon the disciplines of psychology, sociology and anthropology; examining from different angles, how people organise and make meaning of the worlds in which they live. The Institute is an approved RTO by the Australian Government Department of Education, Employment and Workplace Relations as a national Community Services and Health Skills Centre.